Please join us for the ribbon cutting for "A Year With Ai Weiwei: Circle of Animals/Zodiac Heads" followed by reception and discussion with curator, Taliesin Thomas. Guests are invited to meet at Sea Lions Fountain on north end of Civic Center Park at 5:30 p.m. to view Circle of Animals/Zodiac Heads and hear brief remarks about the exhibit's display in Denver October 2017-October 2018. Guests will then return to McNichols Civic Center Building for an opportunity to explore the companion educational exhibit: "Ai Weiwei: Art & Social Change" on the first floor. 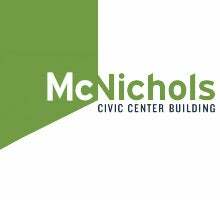 At 6:15 a reception celebrating the project will take place on the second floor of McNichols Civic Center Building where curator, Taliesin Thomas will host a discussion on the exhibit and Ai Weiwei's place as a contemporary artist at 6:30. Ai Weiwei is one of the most compelling figures working in the spheres of international art and political activism. His extraordinary range of creative articulation is unparalleled among his peers—from provocative large-scale museum exhibitions that reference traditional Chinese art forms, to candid Instagram posts at impoverished refugee camps around the world, Ai’s fearless spirit is widely recognized as the heart of his artistic practice. In recent years, Ai’s outspoken stance regarding freedom of expression and basic human rights for all people has established him as leader in the conversation concerning humanity today. In honor of the inauguration of the year-long presentation of Ai Weiwei’s "Circle of Animals/Zodiac Heads" sculpture series in Denver, this public lecture will present a brief overview of Ai’s personal history with a focus on his singular narrative within the field of global contemporary art and beyond.